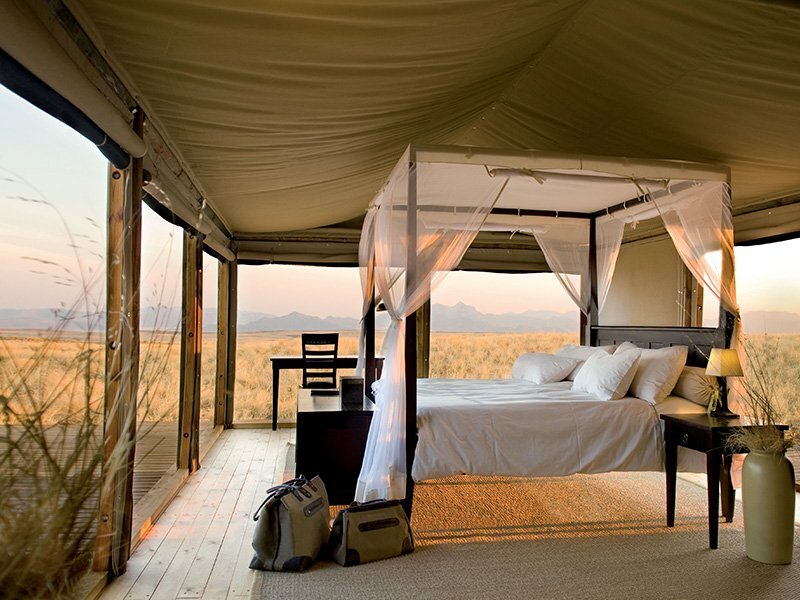 Highlights of Namibia is an 11 night, four camp safari, that be linked either via a flying circuit or by self-driving (as costed below) and is ideally suited for those travellers who have the time to explore this beautiful country at a relaxed pace visiting each of iconic regions that give Namibia its unique character. The itinerary starts in Sossusvlei, on the edge of the immense sand fields of the Namib Desert at Wolwedans Dunes Lodge, close to the huge dunes of the sand desert that stretches for hundreds of miles along the Atlantic Coastline, You’ll then stay for two nights in the Atlantic Ocean coastal town of Swakopmund, an ideal location to explore the marine mammals and bird-life at Walvia Bay. From there you continue your journey northwards into the Kunene region and Camp Kipwe, one of the best wilderness areas in Namibia and home to desert-adapted elephants and the San rock art of Twyfelfontein. Your journey finishes on the edge of the world famous Etosha National Park at Mushara Lodge, from where you can explore the park with its diversity and abundance of wildlife. Met off your international flight into Windhoek International and assisted to your light aircraft for the flight (or self-drive) to NamibRand Nature Reserve, met on arrival with a vehicle transfer to Wolwedans Dune Lodge for a three night stay. The NamibRand Nature Reserve was formed relatively recently by some forward thinking farmers who combined their ranches, taking down the fences and thereby creating a single continuous natural habitat of in excess of 400,000 acres in which the wildlife can roam unhindered. The reserve is self sustaining through high quality low impact tourism with none of the very few lodges allowed to offer more than 20 beds. This gives a ratio of guests to land of 1 person per 2,000 acres, making the properties some of the most exclusive ones in Nambia, if not Africa. 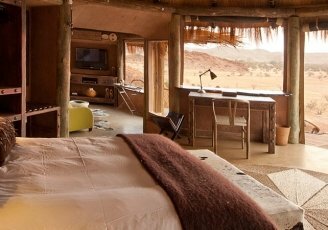 Wolwedans Dune Lodge sits on a sandy ridge with panoramic views offered to its just nine chalets each of which has a verandah and en-suite facilities. Your privacy is assured so much so that if you want to become part of the desert, just roll up your blinds and look out at the stars. The communal parts of the the lodge comprises two comfortable lounges, several of sun-downer decks, a fireplace for the cooler night, a library, the wine cellar and two dining rooms. Activities as arranged by Wolwedans Dune Lodge. 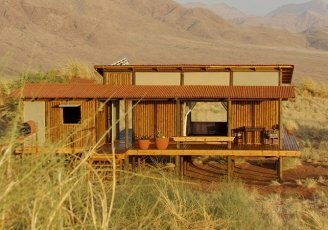 All lodge organised activities take place within the NamibRand Nature Reserve, if you want to visit Sossusvlei this will be under your own arrangements. 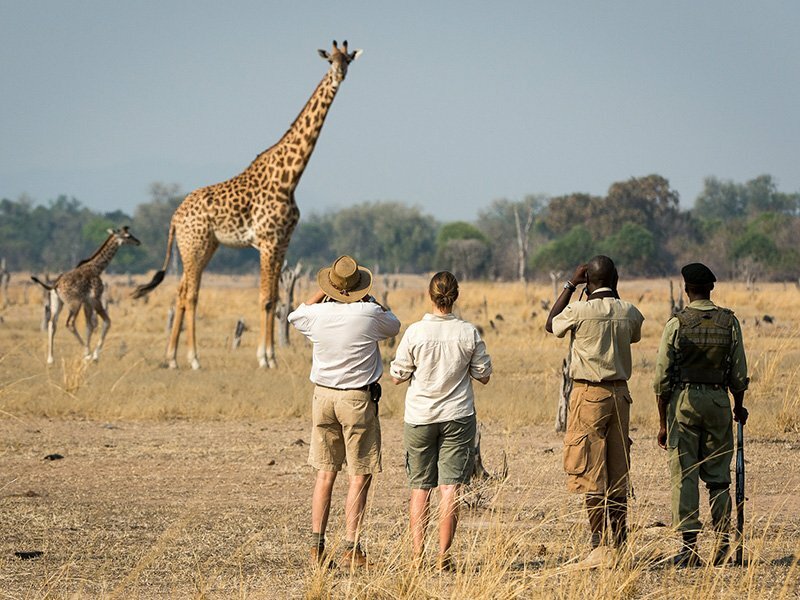 The activities offered include scenic 4×4 drives of various lengths of time from 1-2 hours for a sun-downer drive to a full day, guided walking, balloon flights and horse-riding. Light aircraft transfer (or self-drive) to the Atlantic Coastal town of Swakopmund staying at the The Hansa hotel for a two night stay. The Hansa is the ‘grosse Dame’ of Swakopmund and is situated in the heart of the town, just a few hundred yards from the beach. There are a range of excellent seafood and game restaurants nearby. Optional locally arranged activities which include scenic flights up the Skeleton Coast, lagoon cruises on Walvis Bay’s lagoon, shore based fishing, horse -riding, dune buggying and golf. Light aircraft flight (or self-drive) to Damaraland and to Camp Kipwe for a three night stay. 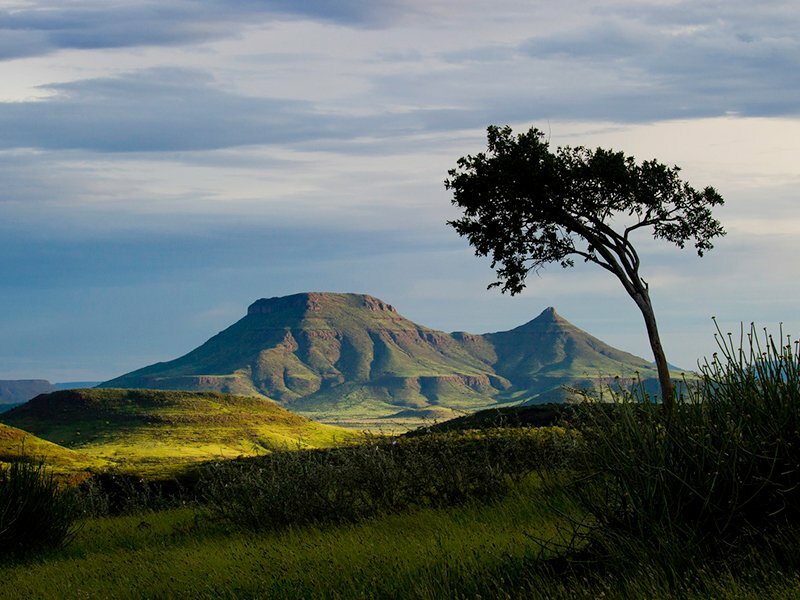 Situated in the remote parts of Damaraland, yet close to Twfelfontein, the World Heritage bushmen’s rock art site, Camp Kipwe can access the (often dry) river beds in the region where desert adapted species such as elephant, giraffe and oryx manage to survive despite the seeming lack of water. 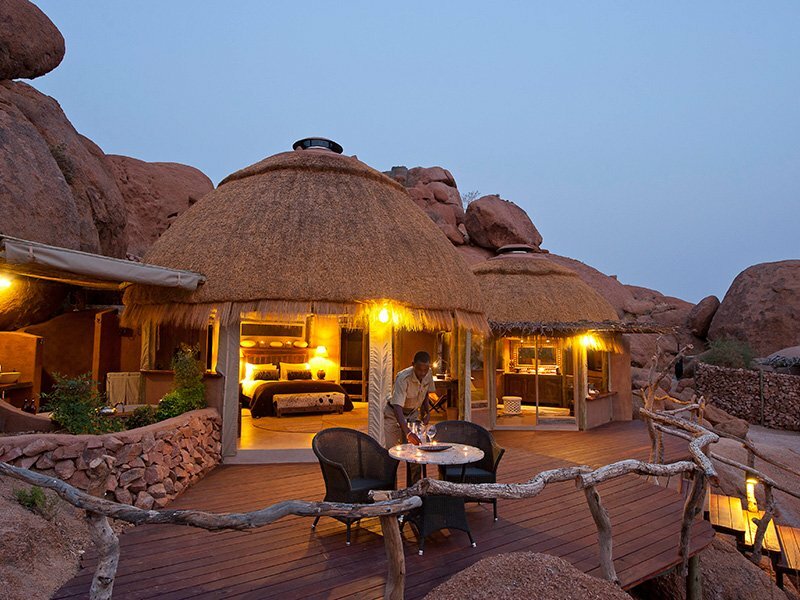 Camp Kipwe has been cleverly sited amongst some huge wind and sand eroded boulders, with their chalets rounded thatched roofs blending in with their environment. Inside each of the just nine chalets and one suite, the styling cues of the location continue with exposed rocks, whilst wooden carvings nod towards the art at Twyelfontein. 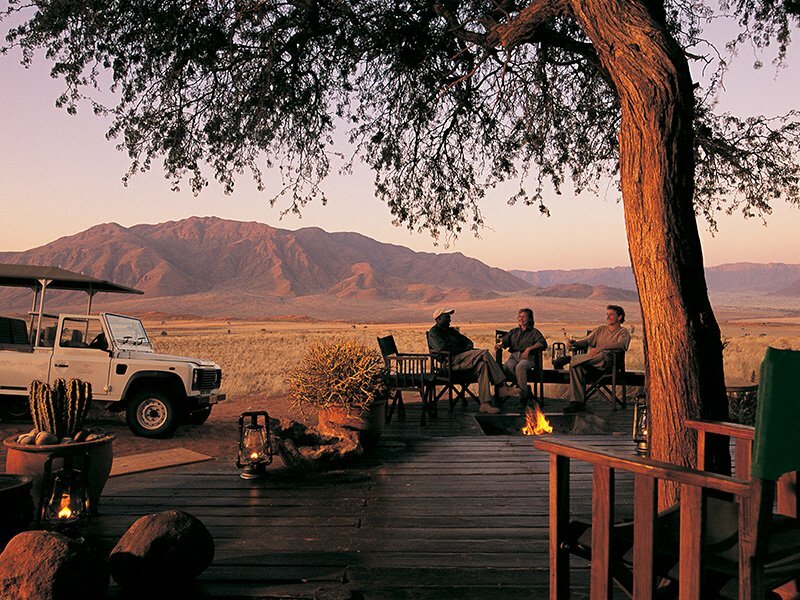 Activities as arranged by Camp Kipwe, whose guides have a wealth of knowledge of the area – you’ll leave fully appreciating, via 4×4 drives and guided walks the wildlife, geology and plant life of Damaraland. A sun-downer with a glass of ‘fizz’ in hand is a special way to end your day. Light aircraft flight (or self drive) to the eastern end of the Etosha National Park and Mushara Lodge for a three night stay. The Etosha is the principal wildlife reserve in Namibia containing a mix of biomes, including a vast salt pan, and hence a wide variety of wildlife including elephant, lion, black and white rhino as well as many of the main plains species such as zebra. 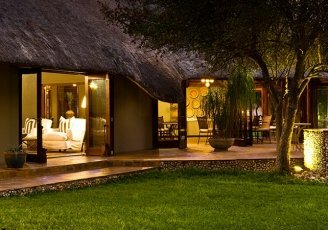 Mushara Lodge, like all privately owned lodges is situates just 5 miles from the Von Lindequist Gate and comprises ten spacious thatched en-suite chalets, a family room, a triple room and two singles, offering flexible accommodation to suit most party make-ups. The pool is a main feature of the lodge, being surrounded by well kept gardens which often have visiting wildlife and always good bird-life. The chalets all have an outlook onto the gardens and pool. Activities as arranged by Mushara Lodge into the Etosha National Park. Travel back to Windhoek in time for your onward international flight. N.B. 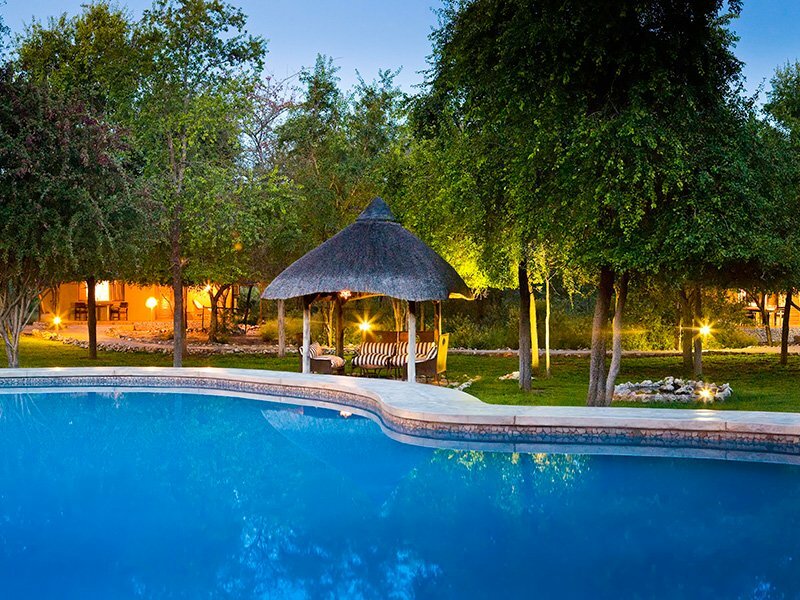 If you would prefer a more genteel start to your safari, we would recommend an overnight stay in Windhoek, so that you start your journey totally refreshed. Price per person based on two guests sharing double/twin accommodation throughout and self-driving using a Toyota Rav GSX.